Are diet and exercise making you feel sluggish? Or do you find it hard to get the energy to work out? 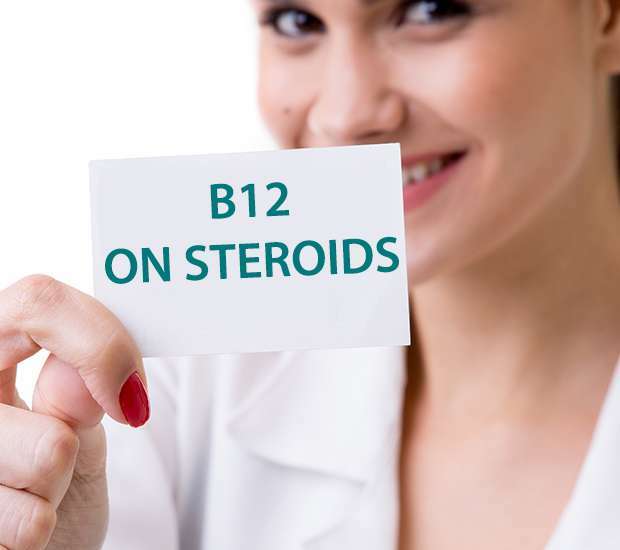 If so, Dr. Rodriguez’s SlimJection B-12 Shot (lipotropic B-12) may be just what you need. Dr. Rodriguez created the SlimJection B-12 Shot to give you an energy boost and help motivate workouts and activities. The SlimJection B-12 Shot is a great aid and tool towards reaching your weight loss goals. It has different components that help your body function better. It helps your nerves work better, sending the right impulses to your muscles and even helps you with thinking and concentration. The SlimJection B-12 Shot is made up primarily of vitamin B12 and other thermogenic agents that help you burn fat, metabolize fat and remove fats from your body. It also helps with the redistribution of fat in your body. Additionally the SlimJection B-12 Shot contains choline, which is a fat emulcifier that helps break up and dissolve fatty foods. It also contains amino acids that reduce fat in your body and help lower cholesterol. Basically, the SlimJection B-12 Shot gives you energy and promotes weight loss in a healthy way. Most people notice benefits within 2 days. Dr. Rodriguez created the SlimJection B-12 Shot with the health and well-being of his patients in mind. Given under the supervision of a physician, the SlimJection B-12 Shot is completely safe and can be just what you need to break through that weight loss “plateau” or fitness goal. What is Dr. Rodriguez’ SlimJection B-12? SlimJection B-12 (Lipotropic B-12) is a mixture of B-vitamins, amino acids, and lipotropic agents. These injections are used, non-invasively, to help patients achieve generalized weight loss. SlimJection B-12 injections can help you lose weight in two ways; boosting your energy and metabolism, and increasing the removal of fat from the body. These “fat-burning” lipotropic injections can be done as frequently as once or twice a week. These “fat-burning” lipotropic injections are distinctly different from lipodissolve or mesotherapy injections. SlimJection B-12 can also be used to enhance the results of the new minimally invasive Smartlipo or Vaser LipoSelection fat removal procedures. Lipotropic literally means fat loving. Basically they are substances that target and help break down fats. What are the main functions of Lipotropics? They prevent the accumulation of fats in the liver. A fatty liver can cause sluggish liver function. They detoxify amines (by-products of protein metabolism). This is important for people on a high protein diet. They increase resistance to disease. They bolster the thymus gland to carry out its anti-disease function by stimulating the production of antibodies and stimulating the growth of phagocytes, cells which surround and gobble up invading viruses and microbes. They also recognize and destroy foreign and abnormal tissue. They mobilize the fat and help to break it down. They are combined with Vitamin B6 to help you lose your water weight and Vitamin B12 which boosts your energy level, among other things (See below). Deficiency of Choline can lead to cirrhosis and fatty degeneration of the liver and hardening of the arteries (arteriosclerosis). It is being used today for ailments such as gallbladder trouble, diabetes, muscular dystrophy, glaucoma, senility, and memory problems (forgetfulness). Choline detoxifies amines that are by-products of protein metabolism. Deficiency of Inositol can lead to accumulation of triglycerides in the liver and hair loss. It works with Vitamin E to facilitate its actions in the treatment of muscular dystrophy. It is used in nerve and muscle disorders such as multiple sclerosis and cerebral palsy. Caffeine may cause depletion of Inositol. It works with Choline to detoxify amines which are by-products of protein metabolism. It acts as a catalyst (promotes better functioning) for Choline and Inositol, opening up their full potential and effectiveness. Along with Choline, it aids in reducing liver fat and protects the kidneys. By elevating serotonin levels in the brain, B6 may help depression and increase mental stamina. They are supplied in sterile injectable form. Physicians generally prescribe 1 cc per week injected intramuscularly. You can easily and safely self-inject at home with instruction from your physician’s office. Why injections and not a pill? Many important supplements are broken down by the hydrochloric acid in your stomach before they can make it to the intestines to be absorbed. For example, up to 98% of oral Vitamin B12 is destroyed in the stomach, so that if you take a 1000mcg pill, only 20mcg may make it into your bloodstream. Injections, with very thin painless needles, are the most effective way to deliver a consistent amount of medicine into your bloodstream.